Hello out there, dearest of Readers! It’s SO SO SO good to be back! I hope you enjoyed the first installment of my vlog earlier this week. Today, I have the great privilege of helping out my fellow author and dear Kindred Spirit, Jack Lewis Baillot with a blog tour and giveaway for her newest release, Finding the Magic! I just finished reading this book a few days ago and OH MY GOODNESS I LOVE IT SO MUCH AACCCCK!!!! It is a Beauty and the Beast retelling, which is near and dear to my heart, and I just love what she did with the story. I will do a more thorough review later, but seriously, this book is simply lovely and I highly recommend it! A cheerful young man named Chip greets me at the door to the enormous house and leads me inside, chattering enthusiastically. He brings me to a large, wooden door, whispers, “good luck” and gives me an apologetic grin as he leaves me to speak with my latest subject. I knock on the door and it opens to reveal a stern man with stiff, gray hair and wild, bloodshot eyes. He stares at me out of those eyes, his shoulders hunched, and scowls deeply. “Excuse me, Mr. Prince, I’m the reporter…” I don’t have time to finish. “No!” he growls, and slams the door in my face. In real life, I would timidly retreat. However, this is fiction, and when dealing with fictional characters, I get to be braver than I would be in real life. I raise my chin and hammer my fist against the door until it re-opens. “I could ask her to end this blasted war I suppose, though I don’t think she has that ability. I guess there is something she could change, but again, it is something I don’t feel you have any reason to ask me about.” He huffs and stares out a window. I sense my dismissal and let myself out, closing the door softly behind me. As I make my way back to the front door, I pass a young girl coming down the stairs. She looks disoriented and achingly sad. I give her what I hope is an encouraging smile… she’s got a difficult task ahead of her, that’s for sure! Are you intrigued? I hope so, because this story is just adorable and I love it to pieces and AAAHHH! Also, it is a Christmas story, so this is the PERFECT time of year to grab a copy and curl up with it. Clocking in at just 56 pages, it’s an easy read that I promise will leave you satisfied, though you might want to flip back to the beginning and read it all over again just so you can spend a little more time with these characters as they find magic in the most unlikely of places! Available on kindle and in paperback, get your copy HERE. 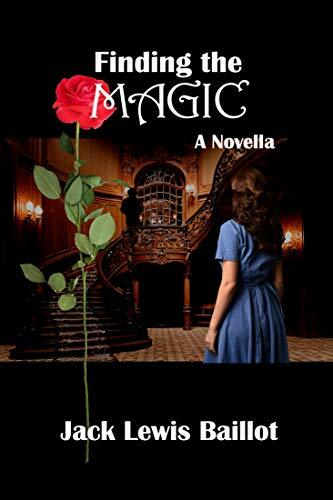 Jack is holding a giveaway where the prize is a paperback copy of Finding the Magic and a box of rose tea. In order to enter the giveaway, follow her on Instagram and comment on THIS POST with the name of someone you think would enjoy reading her book. (There are ways to gain additional entries, as well, so head on over and check that out!) If you’re not on Instagram, you can also enter the giveaway by leaving a comment on her blog HERE. Now it’s your turn, dear Reader! What’s your favorite retelling of Beauty and the Beast? Let me know in the comments! Now if that’s not just one of the best character interviews I’ve ever read!! But then the characters were so lovely to read about (love the book, too!). Loved getting to chat with Adam!